As a company it is important to us to be community minded. We've always had a few charities that we donate to, but we started thinking of some way to raise funds so that we could give more and especially to give locally. In the summer of 2015 we finally transformed our thoughts to action and started The Feather Project. We commissioned local artist Dean Quigley to paint three paintings exclusively for us. Naturally they are feathers: they are three separate scenes within a feather and an indigenous Native Florida pattern in the background. We had these made into original sized giclee canvas reproductions and smaller matted paper prints. This was successful but we wanted to do more. We have been representing Mary Gregory’s art for a few years now. She paints landscapes and birds and wonderful feathers. So we decided to designate three of her feathers as a part of our project. There is a brown feather, a guinea hen feather and a blue jay feather. We purchase these in matted paper prints, small wood art blocks, and larger canvas gilcee reproductions framed in barn wood. Again we have had success with both of these artists but we still want to do more. I was at a tradeshow recently and found a company that has great little wrap bracelets with words of inspiration on them. They are a cause-based company that donates to charities globally. They are called Good Works, and since that’s what we want to do is “good work” we have now added several of their bracelet designs to our project. Now I feel as if we now have a nice variety of items to choose from in The Feather Project collection. 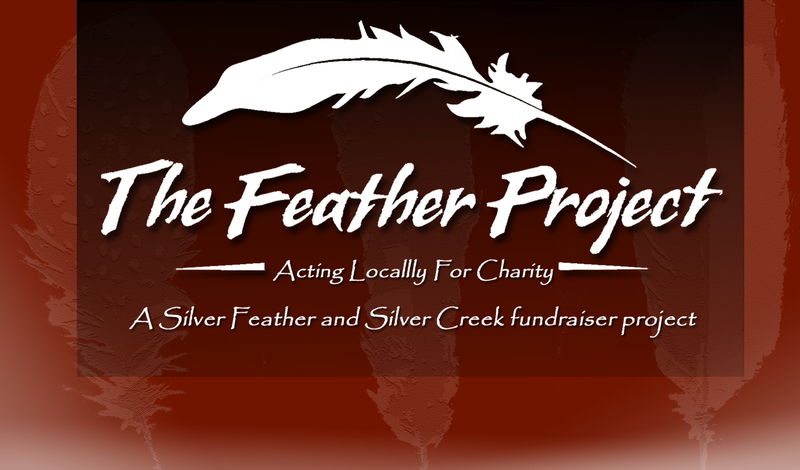 We have committed to giving 100% of the net proceeds from the sales of our Feather Project merchandise to local charities. If you look up "net proceeds" the definition can vary a bit. We are using it to state that everything except the hard cost of the product goes to this fund. So for a $50.00 sale $25.00 goes to charity. One of the things that slowed us down from the beginning is the idea that we would have to start some kind of non-profit and the burden of what that would entail. So I called my accountant thinking I would be in for some hugely complicated process, but his sage advice was to KEEP IT SIMPLE! So simply stated, purchases from our feather project selections are not tax-deductible for you, but you are getting a great product for a fair price as you do with any of our merchandise. I do get a tax deduction for the funds that I donate as I would with any charitable donation. What the Feather Project does is allow us to donate more than we might otherwise be able to, and it allows our customers get involved in the project and our community. Plus it gives us bragging rights; win-win! We have been donating the proceeds generated by The Feather Project to St. Francis House and St. Johns County Council on Aging here in St. Augustine. This could change at some point, but we feel that these two entities do great work in our community for people who can use a hand. From the bottom of my heart and from our entire staff at Silver Feather and Silver Creek we want to thank you for your patronage over the years and the friendship that you share with us. You truly are our reason for doing what we do and you make our jobs fun.